www.sportseventsmagazine.com May 2018 71 Sponsored Content Small Markets...Big On Sports! Joshua Stephens Director of Sports Marketing/Sales "We're ready to take your event to the next level. 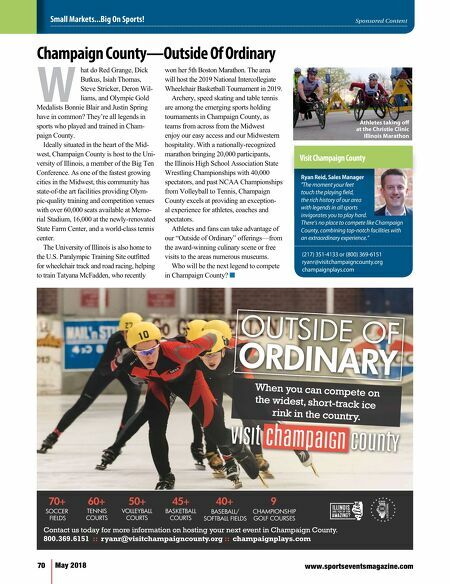 Find out why Butler County, Ohio's the premier Midwest destination for amateur and youth sports." Butler County Visitors Bureau (513) 860-4194 or (888) 462-2282 GetToTheBC.com/Sports all starts with the best venues in the Midwest. Find your championship headquarters in Butler County, Ohio. 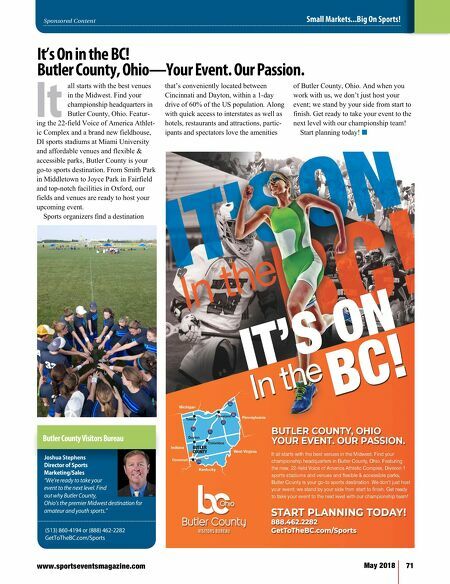 Featur- ing the 22-field Voice of America Athlet- ic Complex and a brand new fieldhouse, DI sports stadiums at Miami University and affordable venues and flexible & accessible parks, Butler County is your go-to sports destination. From Smith Park in Middletown to Joyce Park in Fairfield and top-notch facilities in Oxford, our fields and venues are ready to host your upcoming event. Sports organizers find a destination that's conveniently located between Cincinnati and Dayton, within a 1-day drive of 60% of the US population. Along with quick access to interstates as well as hotels, restaurants and attractions, partic- ipants and spectators love the amenities of Butler County, Ohio. And when you work with us, we don't just host your event; we stand by your side from start to finish. Get ready to take your event to the next level with our championship team! Start planning today! n It It's On in the BC! Butler County, Ohio—Your Event. Our Passion.